Expanding files have the ability to solve on-the-go document storage challenges as well as solving in-office filing space issues. The holders are compact, secure and can expand to store large, growing files. 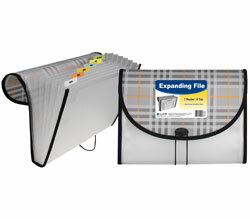 Combine the function of an expanding file with a filing cabinet by using the versatile Expanding File with Hanging Tabs. This file itself is a storage system offering a variety of uses. Organize letter-size documents within the 7 pocket file. Use the retractable hanging tabs to secure the file inside a filing cabinet. Transport documents with ease by sliding the hanging tabs back into place and using the elastic closure to secure pages. Made of heavyweight polypropylene, the file has insertable preprinted tabs that help sort documents. Size: 8-1/2 x 11. 7-Pocket/6-Tab. Bright Green.